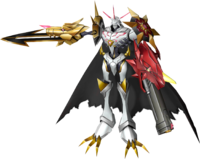 A new face of Omegamon that was born from the fusion of the War Greymon subspecies, "Blitz Greymon", and the Metal Garurumon subspecies, "Cres Garurumon". 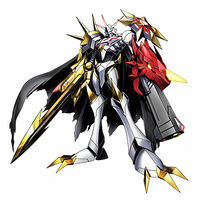 Although it is a different individual from the Omegamon belonging to the "Royal Knights", its multitype performance, which combines the special qualities of the two, hasn't changed, and its strength is also on par with it. 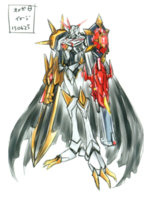 It is a mystery how the two Digimon came to fuse together, and whether this Omegamon is also due to someone's powerful will or a fusion that exists solely due to some sort of wish is unclear. Its Special Moves are firing plasma from its Blitz Greymon-shaped turret (Grey Cannon), and furthermore, its "Garuru Sword" varies in slashing power due to the amount of energy it accumulates at the center of its sword. There is nothing that cannot be cut by a slash attack from its fully charged Garuru Sword. 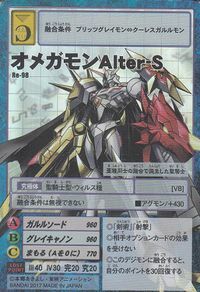 Omegamon Alter-S appears as an enemy Digimon. 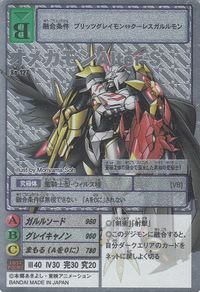 A holy knight born from the fusion between two fellow subspecies Digimon. An unusual holy knight, born from the fusion of two subspecies! 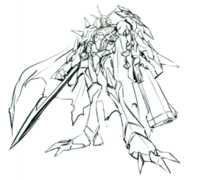 ↑ Omegamon Alter-S was first mentioned in Omegamon Alter-B's profile, which was added in an update patch for Digimon World -next 0rder-. It debuted on the Digimon Reference Book on March 23, 2017. This page was last modified on 2 January 2019, at 20:29.